The Migration Guide to Firebird 3.0 is an excellently written technical manual that is filled with all the essential information anyone wanting or needing to work with Firebird 3.0 (now 3.0.x) will require. Though called a migration guide, this well designed manual provides far more information than simply being relegated to how to move between earlier versions of the Firebird Database Engine and the most recent version of this highly capable database system. As a result, far exceeding the discussion of moving between database systems, this guide provides thorough explanations in detail on the various, unique server types that Firebird offers and how to decide which one is the best option for the requirements at hand, the necessary security configurations for each type of server and how to define users and their associated roles, enhancements to the PSQL language (the SQL variation used by Firebird), discussions on physical access to the server (ie: wire protocols), connection string enhancements, and last but not least, discussion on the Firebird Embedded Database Engine for desktop application development, which has been upgraded from the current 2.5 version. Though written from the perspective of the needs of a Database Administrator, this manual should be an addition to any professional’s library who is serious about working with Firebird for the long term. 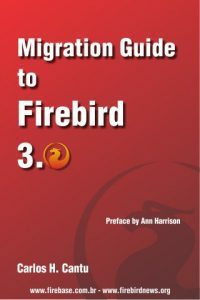 The Migration Guide to Firebird 3 is available both on paper and PDF formats.